Marine Captain Gustave F. Lueddeke, Jr., of Maplewood, New Jersey, one of the first two helicopter pilots cited for bravery in Korea, died Saturday (November 29, 1952) of polio at Bethesda Naval Hospital in Maryland. Captain Lueddeke was stricken seven days ago at the Quantico (Virginia) Marine base. Captain Lueddeke's parents, Mr. and Mrs. Lueddeke of 112 Oakview Avenue, Maplewood, left yesterday to attend funeral services at 10 A.M. tomorrow at Fort Myer, Virginia. Burial will be in Arlington National Cemetery. Mr. Lueddeke is in the auditing department of Fidelity Union Trust Company. Lueddeke's exploits in rescue work in Korea, according to dispatches from the battlefronts a year ago, were a morale booster to men fighting on the ground. Since his return from the battlefront several months ago, Captain Lueddeke had been living with his wife, the former Gertrude B. Marsh of Maplewood and their two children, Robert, 6, and Nancy Lee, 2, at Spotsylvania, Virginia. Captain Lueddeke was of of two Marine pilots who pioneered the use of helicopters in Korea in the early stages of that conflict. He had been cited by his superiors for gallantry in action, both as an observer behind the enemy lines and for the rescue of flyers shot down at sea and behind Communist lines. As far back as December, correspondents covering the Korean War reported that Captain Lueddeke had evacuated at least 80 United Nations' infantrymen from the lines. In one instance, he saved a downed flyer 80 miles out at sea. For his work in Korea, Captain Lueddeke had been awarded the Silver Star, two Distinguished Flying Crosses and eight Air Medals. He also received a Navy Letter of Commendation. Along with his wife, Captain Lueddeke was a graduate of Columbia High School. He volunteered for service shortly after Pearl Harbor and was discharged in 1945. A year later he returned to the service and served two years as a flyer in China. His plane was the last out of Chungking when the Chinese Reds took over that city. Captain Lueddeke was one of seven helicopter pilots assigned to cover the evacuation of Hungnam. As the last of the troops were leaving the waterfront, Captain Lueddeke and the other six were evacuated by a "ferry boat" that turned out to be the mighty battleship Missouri. Captain Lueddeke also leaves a sister, Mrs. Virginia Neeld of Maplewood, New Jersey. The designation "ace" is won by combat pilots on the number of kills with which they are credited. But Lieutenant Gus Lueddeke, Jr., of 112 Oakview Avenue, Maplewood, New Jersey, also is rated as "ace" - for the number of lives he has saves in Korea. Lueddeke is a helicopter pilot with the First Marine Air Wing in Korea. he was one of the first two helicopter pilots to be cited for gallantry in action. His record, according to the latest report from the battlefront, includes the rescue of four downed pilots from behind enemy lines and another 80 miles at sea. He has evacuated more than 50 critically wounded infantrymen from the front lines. Helicopter work in saving the wounded has boosted the Marine's already high morale. As Lueddeke has explained, "Every kid down there knows that no matter where he goes we will get him out if he gets hit. There will be no more abandoning of our wounded." Military honors are coming fast for this Maplewood pilot, who passed up a chance to fly jets for assignment to the "flying windmills." He has been awarded or recommended for the Silver Star, two Distinguished Flying Crosses and eight Air Medals. He has also received a Navy Letter of Commendation. His parents live at the Maplewood address. His father is in the auditing department of Fidelity Trust Company in Newark. Lueddeke volunteered for service shortly after Pearl Harbor and was discharged in 1945. A year later he returned to service and served two years as a flyer in China. His plane was the last one out of Chungking when the Chinese Reds took over that city. He was one of the first helicopter pilots to fly in combat last July. Lueddeke was one of seven helicopter pilots assigned to cover the evacuation from Hungnam. As the last of the troops were preparing to leave the waterfront, Lueddeke and his buddies were advised they would be evacuated to an aircraft carrier by a ferry boat. The ferry boat turned out to be the Might Mo - the USS Missouri. The Silver Star has been won by Marine First Lieutenant Gustave Lueddeke, Jr., who is back in the United States after almost a year in Korea. 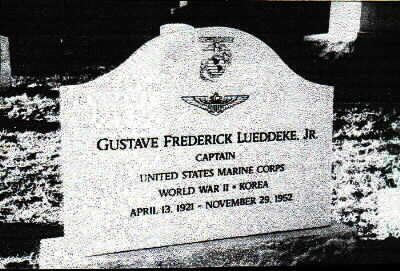 The son of Mr. and Mrs. Lueddeke of 112 Oakview Avenue, Maplewood, New Jersey, the Marine officer was cited for heroic action with the First Marine Division. He also holds the Distinguished Flying Cross and gold stars in lieu of third and fourth Air Medals for other actions in Korea. His wife is the former Gertrude Marsh of Maplewood. The couple, who have two children, a son, and an infant daughter, make their home in Quantico, Virginia. The citation for his awards reads: "For conspicuous gallantry and intrepidity in action against the enemy while serving with a Marine Observation Squadron in Korea on 27 and 28 September 1950. As the pilot of an unarmed helicopter, First Lieutenant Lueddeke made seven flights over enemy held territory to evacuate fourteen United States Army personnel that were isolated from friendly forces by an enemy ambush. Upon learning that a unit of the First Army Cavalry Division had been ambushed and sustained several serious casualties, he volunteered to fly to the area and aid in their evacuation. Although the area was forty-five air miles from his base, and regardless of his own personal safety, he successfully completed his voluntary mission, thereby saving the lives of the wounded United States Army personnel. His actions and devotion to duty were an inspiration to all members of his squadron. First Lieutenant Lueddeke's heroic actions were in keeping with the highest traditions of the United States Naval Service."